It's rarely that a hero is born a day before they head out to adventure. They did something for a while before the call to roam the land and fight its evils took hold. But what, exactly, did they do? What sort of skills did they learn along the way? That's what the Backgrounds are for in Dungeons & Dragons. But even with the couple books that have expanded backgrounds, a player might not really find one that works for the character they're trying to create. That's where the Call to Adventure book comes in. It's up on Kickstarter now and it is simply filled with new bakgrounds. I think it's time to blow this scene. Get everybody and their stuff together. Ok, 3, 2, 1, let's jam. Whoops, sorry. Wrong Tank. This is the TX-225 GAVw Occupier Combat Assault Tank from Star Wars, specifically about how it's coming to Star Wars: Legion. There weren't a lot of armored vehicles in the original trilogy (relatively speaking, for a war movie), but a lot more have showed up since then. Soon, you'll be able to add it to your Imperial forces. Let's take a look at how it works. Along with the mass of Star Wars: Legion announcements from this morning, that's not the only Star Wars game getting something new soon. While many of you were disappointed with the news that the Super Star Destroyer was going to be delayed, Fantasy Flight hopes that announcing a new Campaign Expansion will help pep you up some. Also, there's Star Whales that remind me of the one from Futurama. One of the cool things about Prequel movies is that you can introduce a cool new concept, or unit, or character that's really cool... and then suddenly disappears forever from everything because they can't just go back and work them into the later movies that came out earlier... Such is the fate of the Imperial Death Troopers. But while we won't be seeing them show up in A New Hope anytime soon, you can have them on your Star Wars: Legion tabletops relatively soon. Just as you're picking up your copies of the new Mask of the Oni and Shadowlands books for the Legend of the Five Rings RPG, Fantasy Flight is adding to it all with a new downloadable scenario you can tack on. It's called The Knotted Tails (so, no, it's not a Tails of Equestria adventure), and you can get your copy now. It's quite a release day for Fantasy Flight. They've got Wave III for X-Wing that you can pick up, including fighters for pretty much every faction. They've also got new books for the Legend of the Five Rings RPG out. There's the Shadowlands book as well as Mask of the Oni adventure. All are available now. Happy Friday Eve, everyobody. Also, I realize that it's now spring. A new season is upon us. My week is still extremely busy and just racing by, so let's get you some terrain before we race into the weekend. 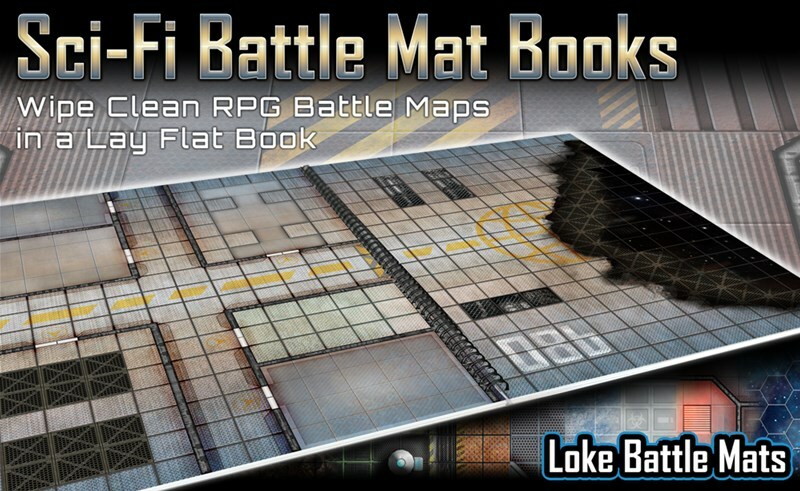 Today in the Terrain Corner we have: New Prepainted Terrain From Manorhouse Workshop, Endor Defense Map for Imperial Assault Announced, New Sci-Fi Battlemat Books Available From Loke Battlemats, and New Map Packs and Battlemat Available For Battletech. I remember when this was just known as "the Jedi Starfighter." But, in reality (or... fictionality? ), it's called the Delta-7 Aethersprite. And you'll soon be able to add it to your X-Wing squadrons. In this preview, we get a look at just how it works, along with some of the different Jedi pilots for it. Building a Death Star isn't easy, and not just anybody could be in charge of the project. For the first Death Star, that fell on Director Orson Krennic (not to be confused with the pig from US Acres). He'll soon be making his way to Star Wars; Legion tabletops, and you can get a look at just how he'll work in this preview. A heavy fighter used by the Republic, the ARC-170 had a lot going on. Both forward and rear-facing acs of fire, potential to carry some heavy munitions, and a whole army of clone pilots to take them into battle. In this preview for X-Wing, we get a look at what they'll be like out on the battlefield.